Title: 'A New Map of North America Shewing its Principal Divisions, Chief Cities, Townes, Rivers, Mountains & c.'. 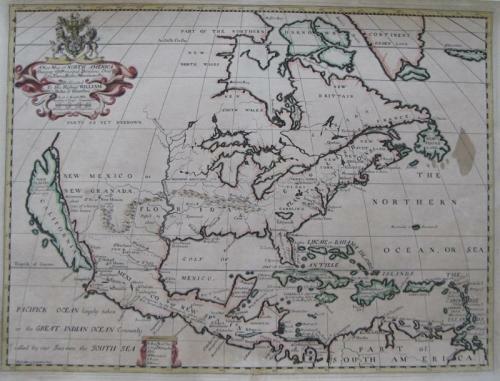 A rare and interesting map of North America. Although the geographic detail is light, the map does note the English claims and Settlements in America. California is shown as an island with the note: "New Albion difcovered by Sir Francis Drake Anno 1577." The Appalachian Mountains are misplaced in the Midwest. The northwest is noted as "Parts as Yet Undiscovered." Very nice title cartouche at top left with a dedication to William Duke of Gloucester. In very good condition. Reinforced crease. Small repaired tear at bottom crease. A couple of minor repairs. Reference: McLaughlin & Mayo: The Mapping of California as an Island: 142. State 4. Portinaro & Knirsch: The Cartography of North America: 1500-1800: Plate CIV. Tooley: The Mapping of America: Plate 53, No. 69.